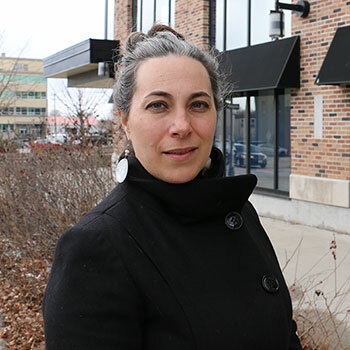 I am an associate professor who primarily teaches in the Health Studies program at the Brantford campus. I received my PhD from the Dalla Lana School of Public Health at the University of Toronto in 2009 and my MA in Performance Studies from New York University in 2002. My work is highly interdisciplinary: I fuse critical theoretical scholarship in health with arts-based practices, including theatre and fiction. In particular I am interested in critical theories of the body, disability studies, public health, the social determinants of health and theatre and performance studies. My current research involves the use of art to facilitate storytelling with people who have intellectual disabilities who have survived institutionalization. This project, entitled Recounting Huronia, is supported by a SSHRC Insight Development Grant. Other recent projects include the creation of a research-based play that uses ethics to make sense of pandemic planning and response (supported by the Canadian Program of Research on Ethics in a Pandemic). I am also the co-creator of The Last Straw: A Board Game about the Social Determinants of Health. Principle Investigator. “Recounting Huronia: An Arts-Based Participatory Research Project,” Insight Development Grant, Social Science and Humanities Research Council (value: $74,000). I am willing in supervising students in the areas of critical social science and health, the body and embodiment, public health research and practice, disability studies, arts-based research and studies about institutionalization and trauma. Rossiter, K. and Robertson, A. (2014). "Methods of Resistance: A New Taxonomy for Health Research within the Neoliberal Knowledge Economy." Social Theory and Health 12, 197-217. Rossiter, K. and Clarkson, A. (2013). “Opening Ontario’s ‘saddest chapter:’ A social history of the Huronia Regional Centre.” Canadian Journal of Disability Studies. Rossiter, K. (2012). “Talking turkey: Anxiety, public health stories, and the responsibilization of health.” Journal of Canadian Studies 46(2), 178-195. Godderis, R. and Rossiter, K. (2012). "‘If you have a soul you will volunteer at once’: Gendered expectations of duty to care during pandemics." Sociology of Health and Illness 35(2), 304-309. Rossiter, K. and Godderis, R. (2011). "Finding the necessary distance: Theorizing ethnographic research-based theatre." Journal of Contemporary Ethnography, 40(6), 648-677. Rossiter, K. (2011). “Bearing response-ability: Theater, ethics and medical education.” Journal of Medical Humanities 33, 1-14. Feagan, R., Rossiter, K. (2011). "University-Community Engagement: A Case Study using Popular-Theatre." Education and Training 53(2): 140-154. Reeve, K., Rossiter, K., and Risdon, C. (2008). "A Board Game About the Social Determinants of Health." Medical Education 42(11): 1125-26. Rossiter, K., Gray, J., Kontos, P., Keightley, M., Colantonio, A., Gilbert J. (2008). "From Page to Stage: Dramaturgy and the Art of Interdisciplinary Translation." Journal of Health Psychology 13(2), 277-287. Rossiter, K. and Reeve, K. (2008). "'The Last Straw!©:' A Tool for Participatory Education about the Social Determinants of Health." Progress in Community Health Partnerships 2(2), 137-144. Rossiter, K., Kontos, P., Colantonio, A., Gilbert, M., Gray, J., Keightley, M. (2007). "Staging data: Theatre as a Tool for Analysis and Knowledge Transfer in Health Research." Social Science and Medicine 66(1), 130-146. Gray, J., K Rossiter, Kontos, P. Colantonio, A., Gilbert, J. Keightley, M. James, S. Machin Gale, S. Nacos, M. (2011). “After the Crash: A Play About Brain Injury.” Canadian Theatre Review 146: 66-86. Rossiter, K. and Godderis, R. (2010). “Abide With Me: A Story of Two Pandemics.” Refereed Working Paper for the Comparative Program on Health and Society, Munk School of Global Affairs. Accessed July 12, 2013. Rossiter, K. and Reeve, K. (2007). The Last Straw!©: A Board Game about the Social Determinants of Health. Published Board Game. The Last Straw!© is distributed by Brunswick Books. As of July 2013 we have sold over 1,000 copies internationally, including to the U.S.A., U.K., Belgium, the Philippines, France, Australia, New Zealand. An important metric regarding exposure is our YouTube training video, which has received 3,567 hits as of July 2013. The game has been translated into four different languages (French, Spanish, Tagalog and Flemish) used in many diverse cultural settings. The game has been acquired by 16 of Canada’s 17 medical schools and has been incorporated as a teaching tool in public health medical curricula. The game is also used as a teaching tool at schools of public health and public health units across Canada. The Last Straw!© was ranked 12th of the top 25 teaching resources on the Social Determinants of Health by Health Nexus. More information can be found at www.thelaststraw.ca.